Governor Edwards’ tepid response to Virginia Governor Northam’s blackface/KKK debacle was notable by his lackluster statement. More significant through his silence has been the governor’s failure to speak out on the late term abortion comments made by Governor Northam when he said that his state would make live born babies comfortable until the mother decided whether or not to literally kill the child. 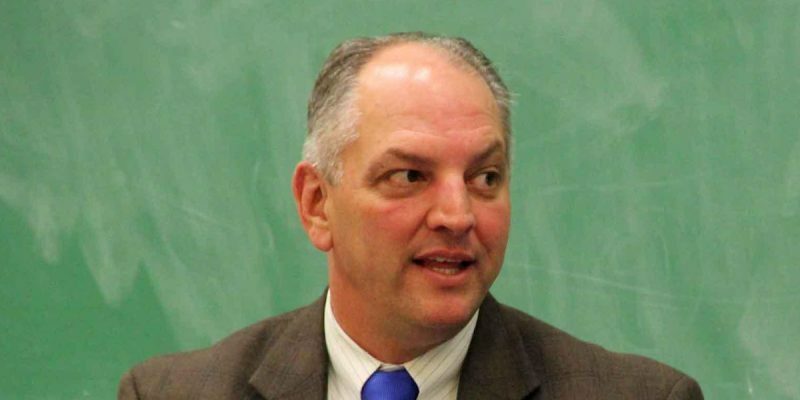 Avoiding standing up as the spokesman for Louisiana’s people on controversial issues by hiding in the Governor’s Mansion has become a standard operating procedure for our governor. After all he is in a tricky spot. As a liberal governor in a conservative state he must maintain the façade of phony conservatism in order to try and fool the majority of voters. Equally he must hold on to his liberal base or else face a disaster in the elections. So what to do? His purely political reaction to national controversy is clear; he simply hides from the critical issues of our time and refuses to tell the people of Louisiana what he actually believes. To aid in his reclusive response to important issues he is protected by a media who, either consciously or perhaps because it just doesn’t have the time, seems bent on refusing to press home probing inquiries. In many cases it seems clear that the media just accepts the purposely misdirected messages that the governor’s staff puts out. Perhaps the single issue that has the most direct impact upon the citizens of Louisiana is our lack of a concise national immigration policy. As the leader of a Louisiana’s people, so desperate for economic relief, this is an issue that our governor should take a prominent position on. Illegal immigration impacts Louisiana in two ways, through economic cost and social cost. Wave after wave of illegal immigrants have supplanted legal American workers especially in the low wage categories of the agricultural, hospitality, dining, light manufacturing, and construction industries. Now many low-skilled, low-to-middle-level wage jobs that were once filled by legal workers are dominated by illegal immigrants. So what are the displaced American citizens, who many times are un- or under-educated, doing? That’s anyone’s guess but, as the illegal immigrants have come in, so to have we seen the rapid expansion of our national welfare state. One could conclude that we are actually hurting our own citizens by providing too much government support to displaced workers, instead of protecting the jobs that they as citizens can utilize to improve themselves. Another issue caused by unfettered illegal immigration is social costs. To a great extent due to illegal immigrants the actual costs of education and health care are rising substantially. Many of our public schools are literally swamped with alien children who don’t speak English. These kids’ educational attainment may be years behind their Louisiana peers; students in our state are already years behind kids in so many other parts of America. The result is a fiscal cost to educate as well as a social impact cost caused by the drag on legal children’s ability to get a quality education. On the healthcare front the same form of fiscal cost is incurred. Whenever illegals are sick or hurt they go to our hospitals and seek medical assistance. Justifiably they are treated but they rarely have any money. So who do we suppose subsidizes those cost? Of course, it’s the Louisiana taxpayer. There are many approaches to immigration reform but they all involve border control as a first step and border control means a physical barrier, not drones or electronic fences. So where is our governor on our lack of a national immigration policy? He recently gave the media a nod to Democrat talking points but that was it. The people of Louisiana, especially the lower income people which abound here, are seriously impacted by illegal immigration. Is our governor for a physical barrier or is he not? Is he for a guest worker program or limiting immigration to a manageable level? Does he want to grant amnesty to the millions of illegal immigrants? Illegal immigration is hurting Louisiana children, taxpayers, and workers. Where is the governor? As a candidate, our governor ran for office on a platform heavy with pro-life sentiment. Was it good politics or was it his fundamental belief? Until this week we had no reason to think that he didn’t sincerely believe, as do the majority of Louisianans, in the fundamental immorality of unfettered abortion. Now the physician governor of Virginia has made the best case we have ever heard of the evil that is infanticide, murder after birth. But where is our governor? If he is as pro-life as he claims he would be out front demanding that Governor Northam leave office based on those comments. Instead, just silence – until the blackface controversy made things easy. Louisiana has long been known as a place lacking a growth economy. Nationally, President Trump has championed the significance of American economic success and has spent a great deal of effort to improve the prosperity of American workers by focusing on trade issues and on bringing manufacturing home. He is taking on issues that his opponents said were impossible to change; President Obama even said we should be satisfied with a weak economy as we were in a “new normal”. But President Trump sees things differently from President Obama and his actions demonstrate that he is not willing to write off the American economy. Back home our governor’s talking points maintain that we have a wonderful state economy, even as it seems almost weekly that we are ranked last in the nation in almost all measures of socieo-economic success. Like President Obama, he must believe that we are the best we can be as he has offered no hint that he thinks that we can do better. So our governor owes us an honest answer, is he willing to tell us that being last in all those measures is the best that we can ever hope for from his leadership? Does he believe that a population mired in poverty is the “new normal” for Louisiana and always will be? One of the hottest topics of our times is the drive by many in the Democrat Party to re-create our nation following a socialist model. The proponents claim that they are not talking about socialism as was imposed upon Cuba or Venezuela; no they propose an undefined “democratic socialism” standard for our future. No one really believes that these radicals just want limited socialism or that one day, if they are successful, we too will look like so many other nations who have foolishly followed the allure of full-blown socialism. In Louisiana we already know through his actions that our governor espouses the precursors to the socialist state – massive growth in government, wealth transfer brought on by high taxes, and a generally anti-business attitude. So the question arises, is our governor satisfied with his unilateral drive for big government or is this just the beginning of a path to his version of Louisiana socialism? Do his actions indicate that he supports the efforts of national Democrats to adopt socialism as the American way? Should we remain a free people or should we become just as cogs in a massive government machine through which the American spirit is sacrificed to the socialist gods? These are fundamental and extraordinarily impactful questions. The people of Louisiana deserve to know what our leader believes; not campaign rhetoric, not reliance on excuses. It is far past time to quit hiding in the Governor’s Mansion in order to avoid taking a position on important issues. The future of Louisiana’s people resides with the decisions made by our leader and it always will. Perhaps the governor actually has no positions. That is at least an answer, but he owes us an explanation if not. If he expects our vote, we must know what does our governor stand for and does that align with the philosophy of the majority of Louisiana’s people.